Spectrem Group’s study Using Social Media and Mobile Technology in Financial Decisions shows that 65 percent of Millionaires with a net worth between $1 million and $5 million (Not Including Primary Residence) own smartphones and 67 percent own tablets. That is up from 41 percent with smartphones in 2011 and only 20 percent with tablets in 2011. Only 4 percent of Millionaires said they did not have a personal computer, smartphone or tablet. 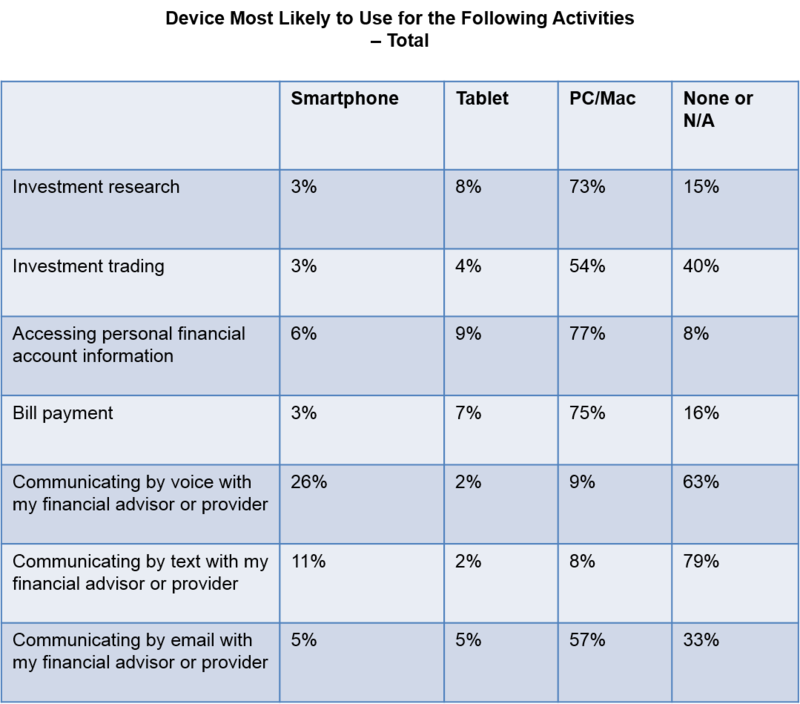 One of the purposes of the study was to note how investors would communicate with financial advisors, and 55 percent said they would use their personal computer or Mac to video-chat with an advisor, 50 percent said they would be willing to use a tablet or e-reader, and 46 percent said they would do so with a smartphone. Investors are still much more comfortable using their personal computer or Mac for investment purposes than turning to their tablet or smartphone. For example, 73 percent said they would use their personal computer for investment research but only 8 percent said they would use their tablet and only 3 percent said they would turn to their smartphone for that purpose. The percentage drops further among newer mobile technology when it comes to making trades, as only 4 percent said they would do that on their tablet and only 3 percent would attempt it on their smartphone, but 54 percent said they would trade on their personal computer. They are even avoiding using mobile technology for bill payment. While 75 percent pay bills via personal computer, only 7 percent do it via tablet and only 3 percent try it on their smartphone. One of the nicest features of mobile technology today is the ability to video-chat with friends and business associates, and a majority of Millionaires use that technology. It is most frequently used on tablets, as 4 percent of tablet owners say they use video-chat mechanisms daily, 20 percent do so weekly, 14 percent do at least once a month and 28 percent said they use it multiple times in a year, for a total of 66 percent reporting video-chat usage at least occasionally during a 12-month period. For smartphones, that total was 57 percent and for personal computers and Macs it was 58 percent.